KIT OR GEAR ~ What's in Your Bag? 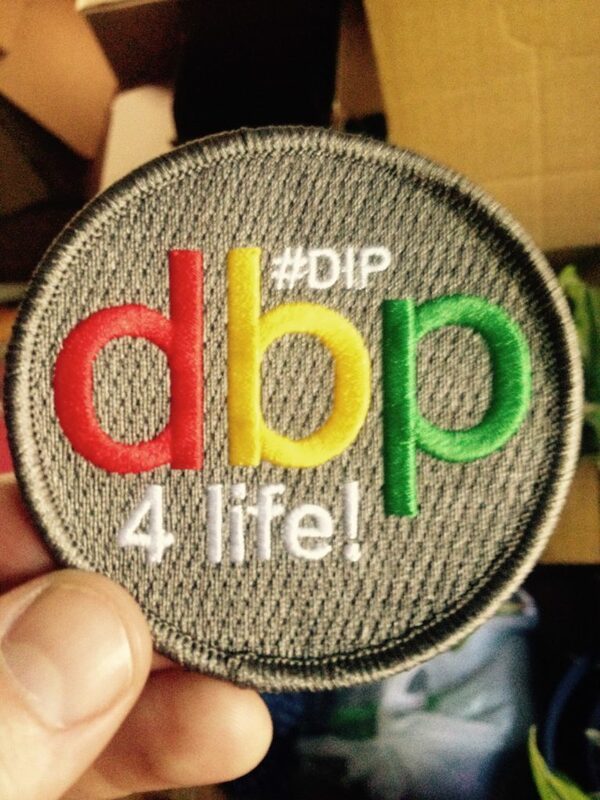 by Chris Macdonald and Chicago Mike Toughill | DBP MAGAZINE ONLINE The World's Best Free Whitewater Publication. 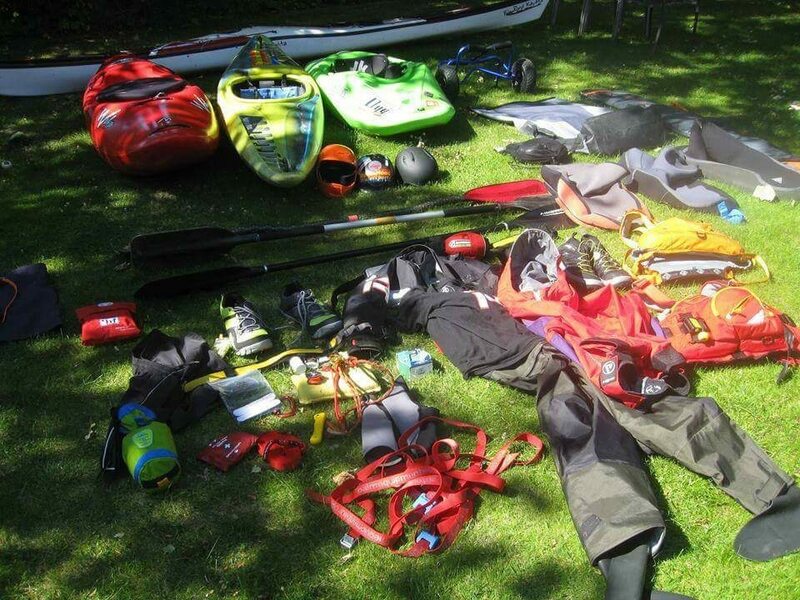 We teamed up Staff Writer and kayaker Chris Macdonald of the UK with Editor/raft guide Mike Toughill of the USA to bring you a kit, or is it gear? guide from both sides of the ocean, age groups (Chris is 20, Mike is 40), and spectrum of whitewater paddling. Enjoy! CM: I have a Jackson Rockstar 2016, it’s great for experts and beginners learning freestyle moves. The bad thing about it is the plastic isn’t that tough; saying that they are easily repaired. I also have a Waka Tuna 2. I think this is the best boat out there, it’s tough, safe on big grade 4⁄5 stuff and you can play in it on grade 2⁄3. I also own a sea kayak made by Big Pond Kayaks, the Mannta. 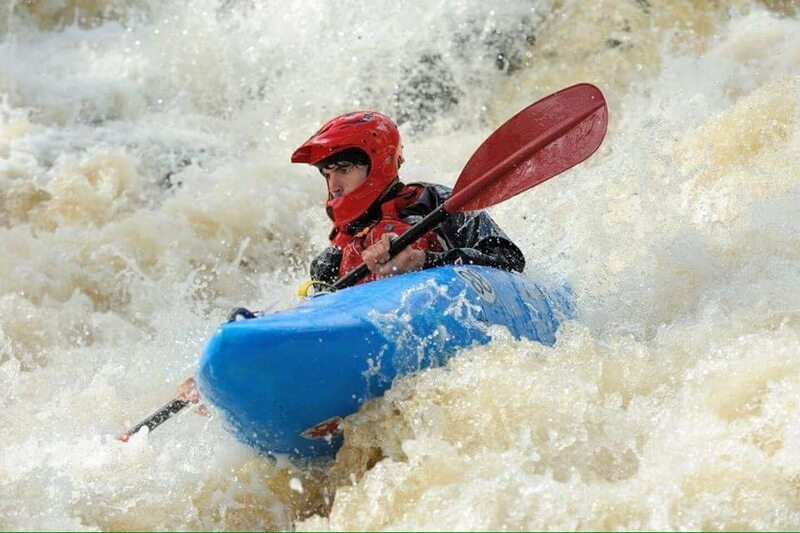 It’s a good sea kayak, super stable, tough, fast and light. It’s made by hand on the Isle of Man. I’m lucky enough to be sponsored by them and take pride in being so. MT: I began boated Hyside Whitewater Inflatables professionally 14 years ago, and I’ll never stop. My go to inflatable kayak is the Hyside Padillac, the ideal safety boat. Mine is almost 20 years old and still stomps out Class 4; I’ve customized mine with an extra thwart for my own cross leg style and I can add thigh straps for Class 5 drops. The extra thwart also gives me a place to strap in my bag for extra gear or beer. I’m super stoked to be boating for Maravia now as well. This summer they sent me a Spider to test drive the big runs here in Wisconsin, and of course it made the trip to the Upper Gauley out east with the DBP crew. This 14 foot raft is fast and sleek with great secondary stability, built very durably and it turns on a dime whether boating R2 or R6. 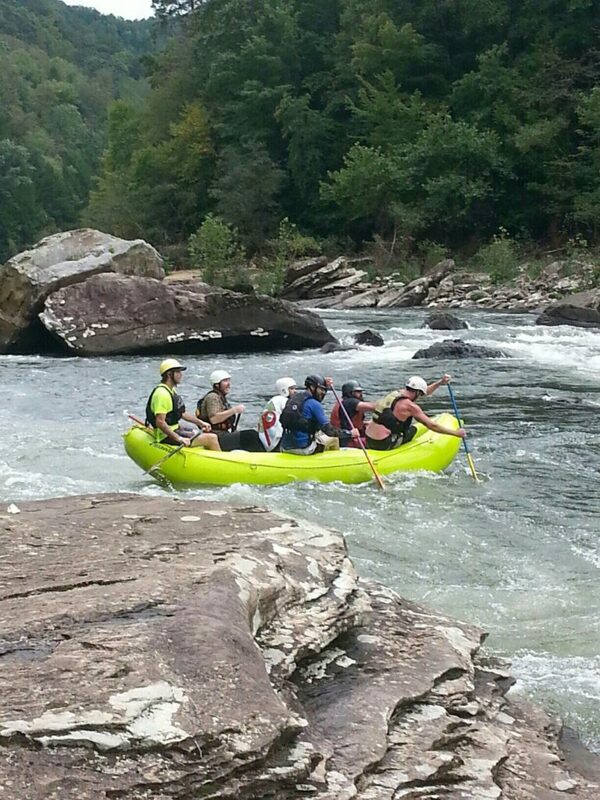 We came in third in the Animal Race boating as a team for the first time, running the Gauley in 1 hour 7 minutes. CM: I wear the Immersion Research Arch Rival Drysuit. At £400 it’s well priced and the first few times I’ve used it it’s kept me bone dry. After a month I scraped it in shallow water and ever since then it’s been letting in a tiny bit of water but I’ve never bothered to send it back because I use it so much. I also haven’t put any stuff on the seals or the zip and it’s holding up well. The fact it lets some water in is MY FAULT due to me not looking after it. Even with a leaky suit I stay warm with my IR Union Suit, it keeps me nice and warm and is super quick drying so can be worn on it’s own. I also own the IR Nano jacket (shortie cag) and Palm Volt neoprene shorts. There both sold at a OK price and are simple which means you can’t really go wrong with them. This is also the case with my Palm Index socks. Both IR and Palm clothing are really good quality. MT: As a raft guide in northern Wisconsin, I need to stay warm in very cold icy conditions. Drysuits here don’t cut it for me; I’ve ripped mine and also had it leak which have made for freezing miserable days on the river- no fun! Therefore I’m an avowed old schooler. I wear a diving farmer John wetsuit (7mm), because if you rip your drysuit your Wallaced, whereas if you rip your wetsuit who cares? My philosophy has always been “why try to stay dry on a river to stay warm? Stay wet!” So I team up my wetsuit with good old fashioned wool top and socks, preferably my stylish Pendleton shirt. I have a durable Level Six paddle jacket and heavy wool sweater for the coldest days. And I never forget my NRS Maverick gloves, they provide optimum dexterity and warmth because sometimes you’ve got to get to work out there, not just paddle. CM: On my feet I wear Palm Camber shoes. These are really good, they grip really well on all surfaces in all conditions (haven’t tried ice yet! Haha). They are really comfy and not too bulky so they’re good to wear creek boating. I just wear my socks when I’m freestyling. Like most of Palm stuff they seem good quality and I would say they are worth every penny. MT: In the summer give me my Astral Brewers. 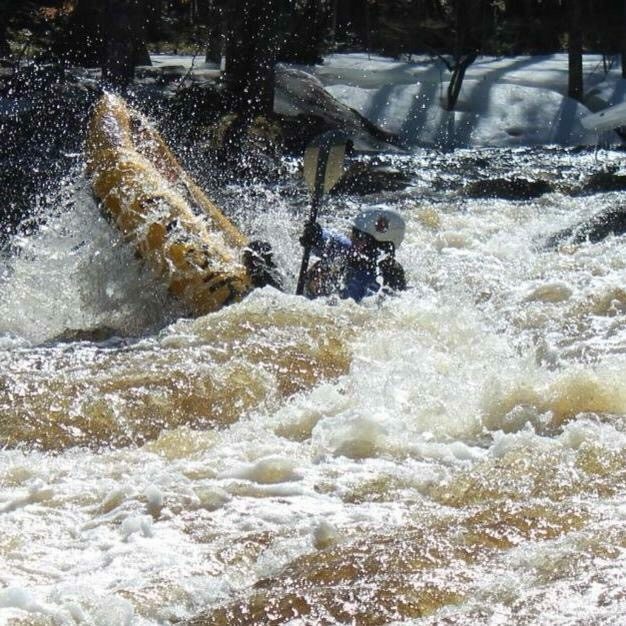 They grip the rocks and take a beating, because when you’re on shore as a guide it’s probably because shits going down and you can’t have shoe failure then, someone’s life could depend on how quick you can get up or downstream. After this year I’ll be retiring the original version I bought four seasons ago. I’m stoked to get the new upgraded treads, but I’ll probably hang my old ones on the wall rather than pitch them, they’ve been so good to me. CM: My first helmet was a Shred Ready, it’s two years old and still holding up well. For more extreme stuff I have a Sweet Rocker full face and also a normal Sweet rocker for coaching and raft guiding. Sweet Protection helmets are the best if you’ve got the money for one ( in my opinion!) but NRS ones seem to be pretty good if you’re doing anything grade 4 and below. Remember with helmets be wise, look around and find the best fitting one which might not be the most expensive! MT: I’ve had quite a few helmets over the years. My next one will be a Madcap. Not only are they stylish as hell, bringing back the old school look from the hairboating days, they are made by real dirtbags who shred the gnar and live the lifestyle. I want my hard earned dollars to go to people who truly love the river like I do. CM: Palm fxr and the extrem are really good. I like the fxr because of its price and toughness. I like the extrem because the many pockets means you can be more organised on the river. MT: I was an Astral man for many years, but when I bought the Stolquist rescue vest four years ago I finally found a PFD durable and versatile enough for a raft guide to get maximum value out of. It’s about time for me to re-up, and you can bet I want the same vest again- I just need to stitch on a DBP patch and pop a PBR in the beer pocket and I’ll be ready to go! CM: I like VE Paddles. They are a British company and make the most powerful, lightweight and durable paddles I’ve ever heard off. I asked Stu Morris, the boss if I could have a look round his workshop to see how they’re built but wasn’t allowed to because there are secrets behind the construction of them. There must be because they feel different from any other paddle I’ve used. However if you want a crank shaft paddle I would go with Adventure Technology. I’ve used them and the crank shafts are amazing and they’re pretty tough. For kayak polo I use a Ainsworth polo paddle because of its value for money. It’s plastic so it’s pretty durable and strong enough for polo matches. MT: Give me a Werner paddle please! My old Player has probably had half an inch shaved off it over the years, but I won’t quit using it till I’m losing it. When raft guiding I’ll use any old custy stick in the barrel because we all know you’re only one good Wallace away from the next paddle you’ll need. No need to drop major coin there. I do wish I had saved enough to get a hand crafted wooden Backlund paddle back in the day when Keith was creating his personalized art in Ohiopyle PA, but let’s face it Dirtbags shouldn’t own nice things anyway. CM: I own a Palm Orbit rand deck and a IR Empire Kling­on bungee cord deck. Both are pretty durable, tough and dry. Although maybe the IR deck is a bit expensive for a bungee deck. The Orbit deck is a fantastic value for a rand deck. For polo I use a Peak UK deck. I would highly recommend Peak UK for competitions, the GB slalom team use them! However I would not recommend them for creek boating or sea kayaking, some of their gear I’ve owned has been a bit poor quality for the price. MT: I push rubber. I don’t wear skirts! Hah!! CM: My knife is a floating rescue knife which is sold by Robin Hood Watersports in the UK. It’s tough, safe, sharp and IT FLOATS, why wouldn’t you have it on a river?! I use HF throw lines most of the time but also like the new Palm Lighting line, it’s stiff neck makes packing super easy. All other rescue equipment like slings and carabiners I use Palm. I also use Palm for other accessories such as paddle bags, kit bags and transportation accessories. The quality of most of it is great and it’s well priced. The only Palm thing I don’t like is their knife. The bite tab is a bit flimsy and I find it hard to open the knife one handed with my mouth. That’s the only thing I don’t like about Palm. MT: I roll with a Gerber multi tool, it’s got the knife and I can use the Philips head screwdriver to take apart and reassemble my K Pump, another key piece of gear for keeping a boat afloat. My throwbag is a Steep Creek Rescue “Dirtbag”, the finest 75 feet of throw rope around, great for both fishing for Wallaced homies or unpinning 16 footers. 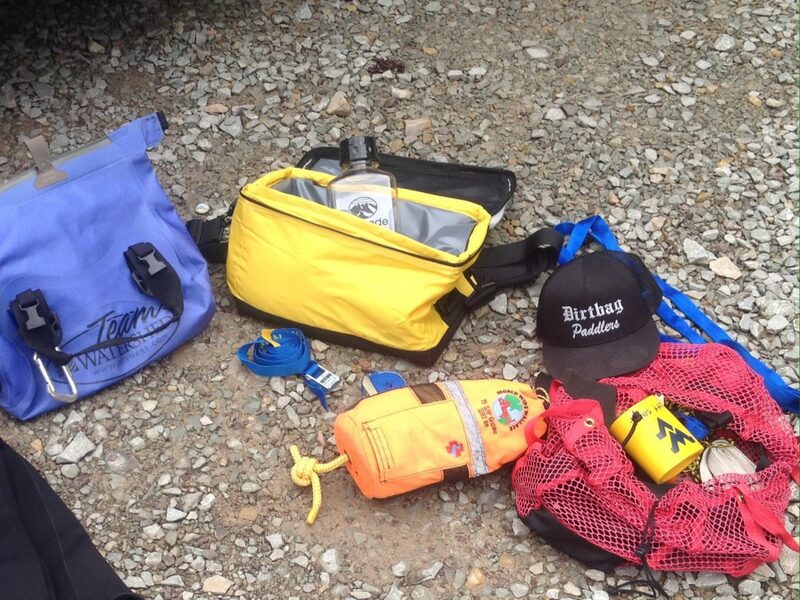 My go to drybag is the best in the business, the Watershed Ocoee bag. I go with the Ocoee because it’s the perfect size for my IK. If I need anything bigger I have my expedition size drybag from Cascade River Gear, and these awesome river people make just about everything else I need that I haven’t mentioned here. Try before you buy, never buy stuff like boats and paddles and helmets before you’ve tried them, making sure you fit etc. 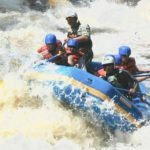 We hope this article will help you choose your next bits of kit, or gear!, and keep you safe and happy on the river! Cheers! !